Hello everyone and welcome back to my blog! Today is my first Halloween makeup tutorial of 2017! 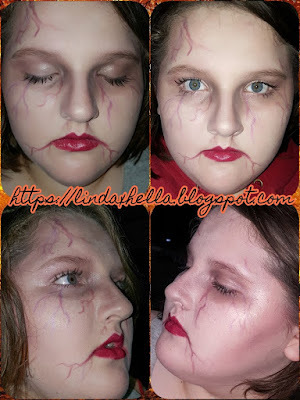 Usually, all of the Halloween looks I do, I do on my kids. So that’s what I did today as well. We did a simple Zombie Makeup Tutorial and watched the new Beauty & The Beast! Although this look is simple it does involves a lot of blending. Don’t let that discourage you, it’s not that hard. I’m not the best at gore or special effects, but I would like to try some out! Without the intro getting too long, let’s get right into this tutorial! This look is a bit backwards for me. I did the face makeup first, which isn’t something I normally do. This is just a habit thing, I use to be real messy with blending. To start out this look I used the Maybelline Baby Skin Instant Pore Erasing Primer on her nose, cheeks and chin. I wanted to really wash her face out and make her super fair, so I used the Maybelline Matte and Poreless foundation in shade 110 Porcelain. This is the lightest shade in the line and has nice coverage. I used just a sheer layer with a generic flat top foundation brush, blending a light layer across the skin. I set the foundation with the Wet N Wild Contouring and Highlight palette in the highlight shade. For the shadowing around the eyes, cheek bones, temples and chin, I used a Natural fiber blending brush (white bristles with a rough texture) and the Maybelline Color Tattoo cream shadow in 35 Tough as Taupe. All you need is a grayish brown shadow to create the look of sunken in features. I used a little product at a time and built up the shadows till I was happy. I wanted to add a little color back into the look so I used the Wet N Wild 5 color shadow palette in The Naked Truth. I tapped into the Eyelid and Defined shades and went over everywhere we used the cream shadow. On the lid I patted a little of the shimmery brow bone shade. Here’s where I started second guessing and annoying myself, lol. I felt like it wasn’t warm enough so I took a blush I made, a shimmery warm pink, and lightly blended some around the eyes and cheekbones by the hairline. 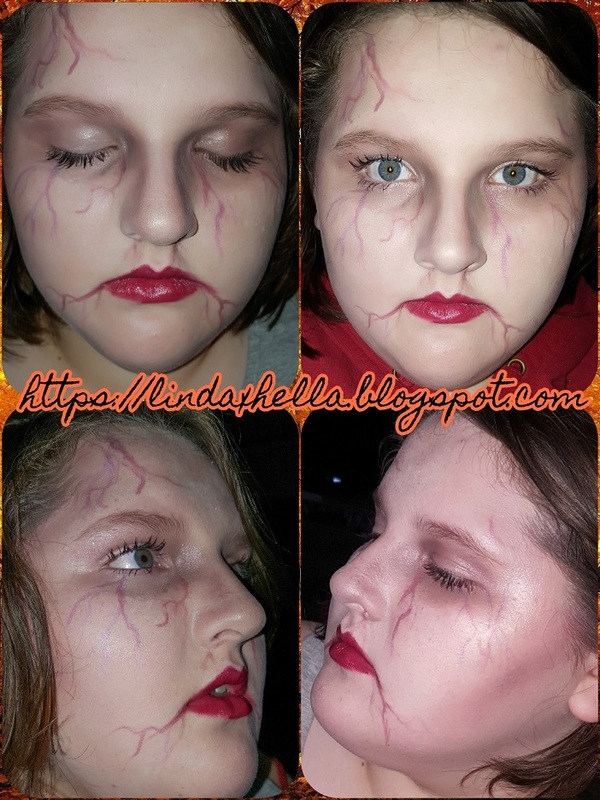 For the veiny look, I took the Hard Candy Powder Keg in Sinful (warm shimmer purple) and a dark generic purple shadow on a wet eyeliner brush and made some squiggles where I thought they looked right. On her lips, I used the two darkest red shades in the BH Cosmetics Shaaanxo Palette and blended them together with a flat lip brush. I also filled in brows lightly, added mascara and did a little highlight. That’s it guys! It’s so simple. You don’t have to use all of the products I used, just improvise! Get creative and have fun. This is Halloween, it doesn’t have to be perfect! Perfect can be boring lol. Thank you so much for checking out this tutorial. We had fun doing it and I can’t wait to do more!